One of my favorite things about these tamales is that my sister made them! She, like myself, have made it our goal to learn Mom’s recipes and share them. This was a group effort because she was unfamiliar with working with masa harina. She is fortunate to live in California, where there are an abundance of tortilla factories and fresh masa is easy to come by. 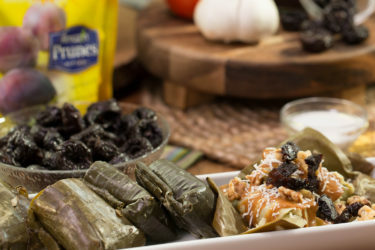 These will be on my tamal menu every holiday season, for sure!! Start by soaking the corn husk in some really hot water. Use a heavy bowl or pot to weigh down, set aside. In a large bowl, combine the masa harina, salt and baking powder. Gradually add in the warm chicken broth and work in until dough forms. In another glass bowl, melt the shortening or manteca (lard), then work well into the masa mixture. Cover with plastic wrap and set aside. In a pot, combine the clean tomatillos, onion, and chile serrano. Fill with enough water to cover, cover and bring to a boil. Reduce heat, stir and cook for an additional 20 minutes. Drain the water and transfer to the blender, add cilantro and 1 teaspoon of salt, blend until smooth. Transfer to a bowl, taste for salt and set aside. Prepare a large steamer pot with water, set aside. Once everything is in place, shake of excess water from husk. Take one husk (about 5 inches across) and using the back of a spoon spread enough masa to cover the surface (not too thick). Get as close to the edge as you can with the masa. It’s OK to leave a small border. Add a strip of cheese, roasted green chiles and some salsa verde. Fold in the sides, then fold down the flap and wrap tightly with foil or deli paper. Stand up in steamer pot with open side up. 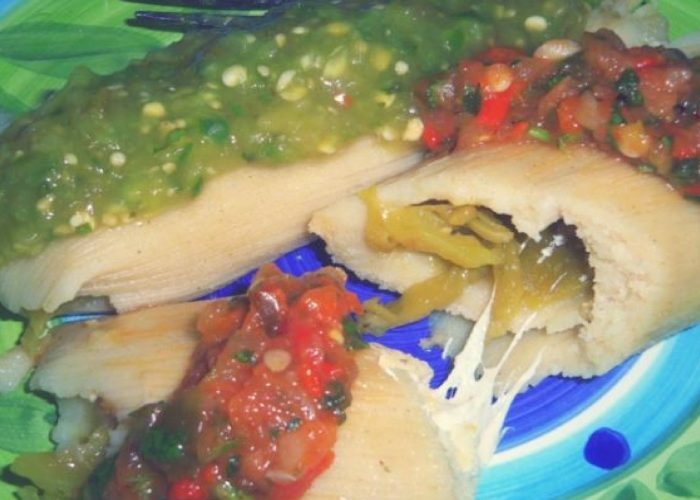 Reserve extra salsa verde to garnish cooked tamales. 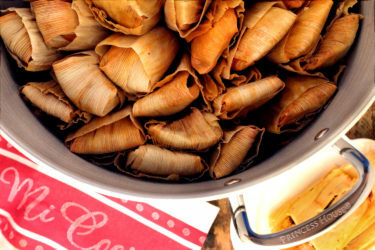 Once all tamales are done, fill bottom of pot with water, insert steamer and arrange the tamales. Bring to a quick boil, then reduce heat to medium. Steam for 1 hour, checking for water after minutes. After 1 hour, pull out 1 tamale and let cool slightly, if the husk pulls away easily from masa, they are done. If not, steam for another 15 minutes. Let tamales cool in the covered pot. Yields 15 to 18 large tamales. 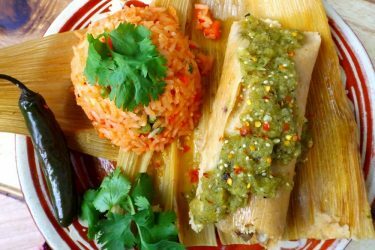 Garnish the tamales with extra salsa verde!